It’s always difficult adjusting to the routine of regular life when I get off the road. Storm chasing embodies freedom for me – the ability to go wherever I wish, according to nature’s whims, to follow the weather. I am totally immersed in my passion. I love being at home, too, but my attentions are fragmented. I have to work to earn a living, acknowledge bills and deal with the drudgery that comes from basic life maintenance. (Though laundry follows me even on the road.) At least Florida offers storms in the summer, although the photo opportunities are more scant than you might think, especially for lightning. Last night, I headed out in hopes of catching some lightning in a severe storm that was approaching the east-central coast. Most of the bolts seemed buried in rain, and I was preparing myself for disappointment. I decided to give it a few more minutes in case it went into anvil-crawler mode, and I was pleasantly surprised by a handful of spectacular crawlers. See all the photos here. I recommend clicking on the thumbnails and viewing the large images as a slide show so you can see the detail in the bolts. 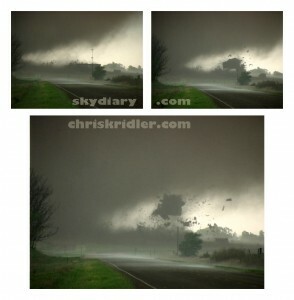 In the meantime, I’ve updated my 2012 chase reports and photos from Tornado Alley, but I still have a couple of videos to add. In between the obligations of reality, that is. Sometimes you’re rewarded by playing the marginal setup when it comes to storm chasing. Our group opted out of the 10 percent tornado risk on Thursday, May 24, as issued by the Storm Prediction Center for Wisconsin and environs. We didn’t like the idea of chasing fast-moving storms in the trees up north. Instead, chasing with Dave Lewison, Scott McPartland, Dayna Vettese, Brad Rousseau, and Simon Eng, we headed toward eastern Kansas. 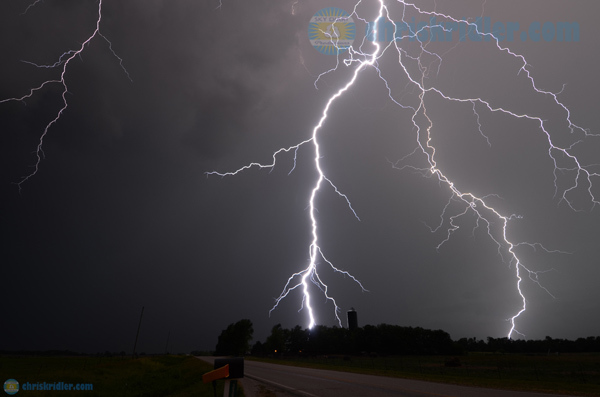 After a lot of waiting and hanging out with cows in a sunny meadow in Garnett, Kansas, we were fortunate to catch a late-day storm that was beautifully sculpted and produced tremendous lightning, though it was never severe-warned. See the photos here. I’ve done almost nothing but drive for the past two days – I’ve made it from Rockledge, Florida, to North Platte, Nebraska. That’s more than 1700 miles. And Tuesday, it looks like I’m headed into the Dakotas for a slight chance of severe storms … but I’m not sure if it’ll be North or South Dakota. It will depend on my sleep, my driving, and of course, my forecast in the morning. Meanwhile, here’s a quick look at a photo from Sunday. 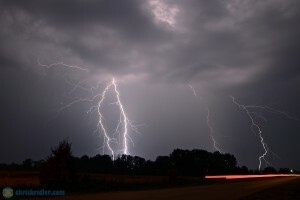 I stopped for several minutes outside Jeanette, Arkansas, and took some lightning photos. I’ll post more later. This is always the problem with all the driving while storm chasing – it’s hard to squeeze in the Internet updates! I’m tired … it’s late … and I have to get my sleep schedule turned around before my epic drive to Tornado Alley in a couple of days. But I had to post images and video from Thursday’s chase of a beautiful severe storm in Brevard County, Florida. Find the photos and video here. 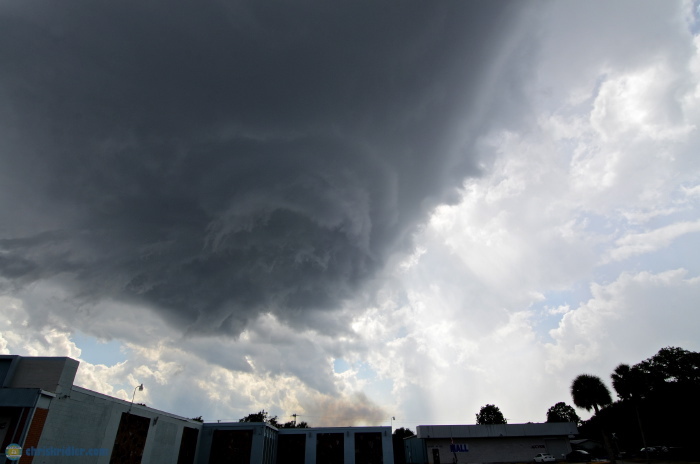 This tower building south of a storm in Port St. John, Florida, on May 15, 2012, actually showed rotation for a short time. Note the smudge of smoke at the horizon, from a fire caused by lightning. It’s one of those Mays when Florida seems to be getting as much or more weather as Tornado Alley – at least this week. 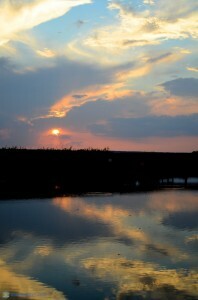 I’ve had chases in past years when I was getting a sunburn in the Plains as I watched amazing weather unfold in Florida. Well, I’ve held off on my Plains storm chase this year because of the weird pattern, so I’ve had a chance to do some chasing at home. It looks like I’ll head out to the Plains in a few days, however – FINALLY – but in the meantime, here’s some Florida action: my chase report from May 15, with photos and video. 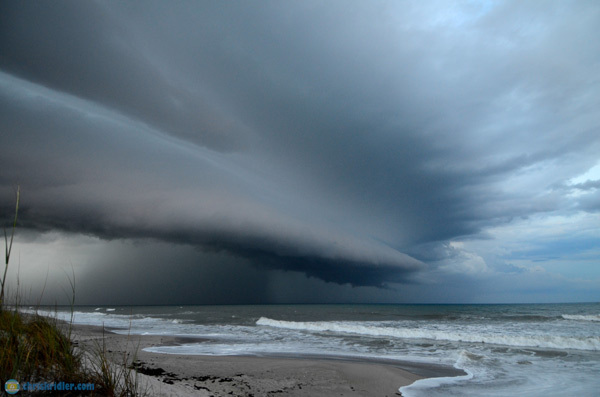 Florida storms tend to be more subtle than those stunning Plains supercells, but they’re beautiful, too. And we might have more today. You know, I really thought this would be one year when I wouldn’t have to cut my storm-chase trip to Tornado Alley short because of my schedule and miss some big event. I thought I’d be chasing by the first week of May and could even go a couple of weeks into June if the pattern remained stupendous. Only it’s stupendous in a totally different way. After really early season events that I couldn’t chase because of other commitments, the pattern has afforded very few storms this month, and I’m still in Florida, playing the waiting game. Chances are, the action could pick up again at the end of this month, or in June, but I have to be back in Florida mid-June for, yes, obligations. Because I just can’t block off two or three months for chasing storms at this point in my life. What’s giving me the mopes? Long-range computer models. There’s an old saying in chasing: Live by the models, die by the models. You can’t rely on them too much. But they’re the next best thing to a crystal ball, so models, along with a feel for climate fluctuations and recurring patterns, and instinct are about all we have to go on. I’ve been obsessing over the GFS and the European models, which still haven’t figured out the end of the month but have been trending toward a ridge, or at least an extreme northern path for the business end of the jet stream in a possibly zonal pattern, with embedded short-wave troughs that may produce weather. Occasionally a GFS run will pull a trough (desirable for storms) out of its goodie bag, but it’s all fiction past a few days. No matter what I say now, this outlook may change in five minutes. May 12 is what my chaser friends call “the anniversary.” For a small group of us, it marks the anniversary of two big events – the May 12, 2004, Attica, Kansas, tornadoes, one of which destroyed a house less than a half-mile away from us, and the May 12, 2005, tornado and hail barrage near South Plains, Texas. I’ve been pulling choice video from my archive and posting it to my YouTube channel. Today, I’m posting a 10-minute, raw-video cut of the Attica, Kansas, tornadoes. 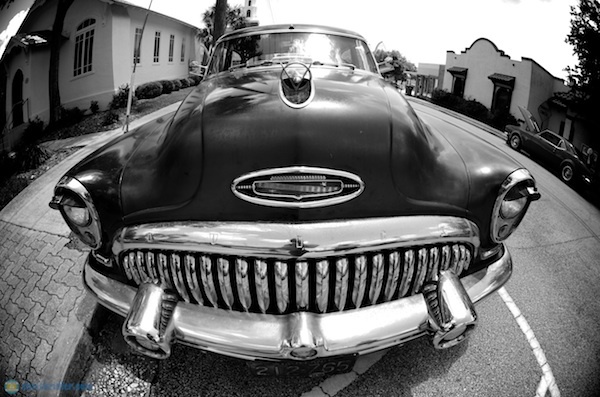 Dave Lewison was in my car, and Pete Ventre was driving Scott McPartland in Scott’s car. The video is amusing for its stressed-out dialogue as we try to avoid baseball-size hail, maintain position without getting too close, and narrowly miss two satellite tornadoes that briefly blocked our escape route. There’s also a sighting of the early TIV, Sean Casey’s Tornado Intercept Vehicle. Meanwhile … it’s pretty quiet. I’ve done almost all the tinkering my chase gear requires. I’m working on the sequel to my novel “Funnel Vision,” which at least affords the excitement of fictional storm chasing. But it’s May. We should be experiencing the real thing. 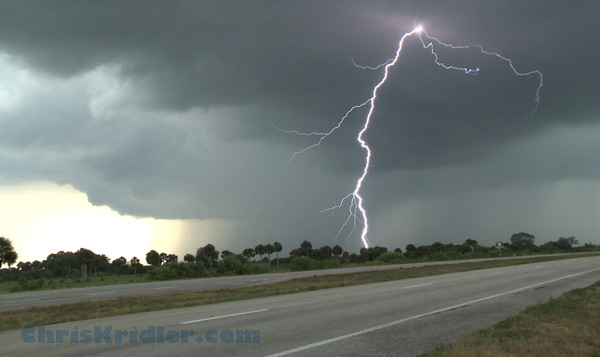 I chased storms near home in Brevard County, Florida, on Monday. It was a good way to work out my gear, in hopes that I might actually have a chance to use it in Tornado Alley soon. The pattern in the Plains is not conducive to widespread severe weather, and it appears conditions will remain that way for a while. 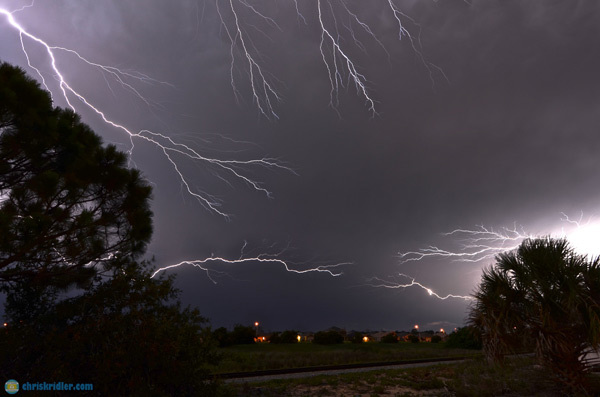 So … I chased lightning storms, and mostly messy storms, around the Space Coast. There was one nice storm in West Melbourne that had surprisingly interesting structure for a while, along with intense lightning. I’ve featured that storm in a video on a page with photos on my sister site, SkyDiary.com, which is storm-chasing central. See the chase account here.